Christmastide (also Christmas Time or the Christmas season) is a season of the liturgical year in most Christian churches. In some Christian denominations, Christmastide is identical to Twelvetide, a similar concept. For most Christian denominations, such as the United Methodist Church and the Roman Catholic Church, Christmastide begins on Christmas Eve at sunset or First Vespers, which is liturgically the beginning of Christmas Day. Most of Christmas Eve, understood as 24 December, is thus not part of Christmastide, but of Advent, the season in the Church Year that precedes Christmastide; in many liturgical calendars, Christmastide is followed by the closely related season of Epiphanytide. There are several celebrations within Christmastide, including Christmas Day (25 December), St. Stephen's Day (26 December), Childermas (28 December), the Feast of the Holy Family on New Year's Eve (31 December), the Feast of the Circumcision of Christ, the Solemnity of Mary, Mother of God and New Year's Day (1 January), as well as Epiphany Eve or Twelfth Night (the evening of 5 January). Customs of the Christmas season include carol singing, gift giving, seeing Nativity plays, attending church services, and eating special food, such as Christmas cake. Traditional examples of Christmas greetings include the Western Christian phrase "Merry Christmas and a Happy New Year!" and the Eastern Christian greeting "Christ is born! ", to which others respond, "Glorify Him!" Christmastide begins very early on 25 December. Historically, the ending of Christmastide was 5 January. This traditional date is still followed by the Anglican Church and Lutheran Church, where Christmastide, commonly called the Twelve Days of Christmas, lasts 12 days, from 25 December to 5 January, the latter date being named as Twelfth Night. 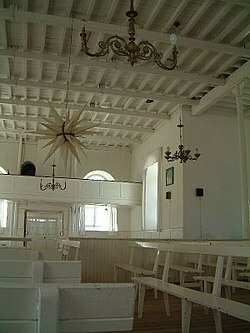 During the Christmas season, various festivities are traditionally enjoyed and buildings are adorned with Christmas decorations, which are often set up during Advent. 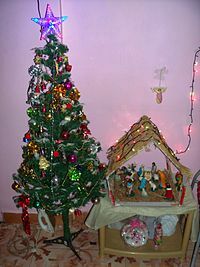 These Christmas decorations include the Nativity Scene, Christmas tree, jingle bells, as well as various Christmas ornaments. In the Western Christian world, the two traditional days on which Christmas decorations are removed are Twelfth Night and Candlemas. Any not removed on the first occasion should be left undisturbed until the second. Leaving the decorations up beyond Candlemas is considered to be inauspicious. On Christmas Eve or Christmas Day, the start of Christmastide, it is customary for most households in Christendom to attend a service of worship or Mass, in which they receive Holy Communion. During the season of Christmastide, in many Christian households, a gift is given for each of the Twelve Days of Christmastide, while in other Christian households, gifts are only given on Christmas Day or Twelfth Night, the first and last days of the festive season, respectively. The practice of giving gifts during Christmastide, according to Christian tradition, is symbolic of the presentation of the gifts by the Three Wise Men to the infant Jesus. In several parts of the world, it is common to have a large family feast on Christmas Day, preceded with grace. Desserts such Christmas cake are unique to Christmastide; in India, a version known as Allahabadi cake is popular among the Christian population and consumption of it has spread to other parts of the world. During the Christmas season, it is also very common for Christmas carols to be sung at Christian churches, as well as at the footsteps of houses—in the latter scenario, groups of Christians go from one house to another sing Christmas carols, a form of evangelism. Popular Christmas carols include "Silent Night", "Come, Thou Long Expected Jesus", "We Three Kings", "Down in Yon Forest", "Away in a Manger", "I Wonder as I Wander", "God Rest Ye Merry, Gentlemen", "There's a Song in the Air", and "Let all mortal flesh keep silence". In the Christmas season, as with Eastertide, it is very common for television stations to air feature films relating to Christmas and Christianity in general, such as The Greatest Story Ever Told and Scrooge. In Russia, Christmastide, understood as the period between Orthodox Christmas and Epiphany, is often referred to as "Svyatki". During this period, Russians perform fortunetelling by the use of shadows, candles, wax, and boots to predict future marriages. Maidens who participate in the ceremony have to shed everything that "hinders" the flow of spirits including their belts and rings. They also have to let their hair down. In the Eastern Orthodox Church, Christmas is the third most important feast (after Pascha and Pentecost). The day after, the Church celebrates the Synaxis of the Theotokos. This means that Saint Stephen's day and the feast of the Holy Innocents fall one day later than in the West. The coming of the Wise Men is celebrated on the feast itself. For more information, see Nativity Fast and Christmas Eve. ^ Green, Jonathan (2009). Christmas Miscellany. Skyhorse Pub. p. 116. ISBN 978-1-60239757-6. Retrieved 28 March 2015. This period of time has come to be known as both Twelve-tide and Christmastide. In Medieval England, it was a time of continuous feasting and merrymaking. ^ An Explanation of First Vespers Archived 6 January 2015 at the Wayback Machine. ^ "Introduction to Christmas Season". General Board of Discipleship (GBOD). The United Methodist Church. 2013. Retrieved 5 January 2015. Christmas is a season of praise and thanksgiving for the incarnation of God in Jesus Christ, which begins with Christmas Eve (December 24 after sundown) or Day and continues through the Day of Epiphany. The name Christmas comes from the season's first service, the Christ Mass. Epiphany comes from the Greek word epiphania, which means "manifestation." New Year's Eve or Day is often celebrated in the United Methodist tradition with a Covenant Renewal Service. In addition to acts and services of worship for the Christmas Season on the following pages, see The Great Thanksgivings and the scripture readings for the Christmas Season in the lectionary. Use the colors of white and gold and materials of the finest texture for paraments, stoles, and banners. Signs of the season include a Chrismon tree, a nativity scene (include the magi on the Day of Epiphany), a Christmas star, angels, poinsettias, and roses. Gold, frankincense, myrrh, and three crowns are appropriate on the Day of Epiphany (January 6 or the Sunday nearest). ^ Clergy Resources: "The Christian Year"
^ a b Bratcher, Dennis (6 January 2014). "The Season of Epiphany". Christian Resource Institute (CRI). Archived from the original on 2014-10-29. Retrieved 20 December 2014. Christmas begins with Christmas Day December 25 and lasts for Twelve Days until Epiphany, January 6, which looks ahead to the mission of the church to the world in light of the Nativity. The one or two Sundays between Christmas Day and Epiphany are sometimes called Christmastide. For many Protestant church traditions, the season of Epiphany extends from January 6th until Ash Wednesday, which begins the season of Lent leading to Easter. Depending on the timing of Easter, this longer period of Epiphany includes from four to nine Sundays. Other traditions, especially the Roman Catholic tradition, observe Epiphany as a single day, with the Sundays following Epiphany counted as Ordinary Time. ^ a b Geddes, Gordon; Griffiths, Jane (2002). Christian Belief and Practice. Heinemann. p. 102. ISBN 9780435306915. Carol singing is a common custom during the Christmas season. Many Christians form groups and go from house to house singing carols. The words of the carols help to pass on the message of Christmas to others. ^ a b Kubesh, Katie; McNeil, Niki; Bellotto, Kimm. The 12 Days of Christmas. In the Hands of a Child. p. 16. The Twelve Days of Christmas, also called Twelvetide, are also associated with festivities that begin on the evening of Christmas Day and last through the morning of Epiphany. This period is also called Christmastide ... one early American tradition was to make a wreath on Christmas Eve and hang it on the front door on Christmas night. The wreath stayed on the front door through Epiphany. Some families also baked a special cake for the Epiphany. Other Old Time Traditions from around the world include: Giving gifts on Christmas night only. Giving gifts on the Twelfth Night only. Giving gifts on each night. On the Twelfth Night, a Twelfth Night Cake or King Cake is served with a bean or pea baked in it. The person who finds the bean or pea in his or her portion is a King of Queen for the day. ^ a b Martin, Charles Basil (1959). The Survivals of Medieval Religious Drama in New Mexico. University of Missouri Press. Retrieved 30 December 2015. ^ a b Nair, Malini (15 December 2013). "Cakewalk in Allahabad". The Times of India. Retrieved 28 March 2015. Around early December, an unusual kind of pilgrim starts to take the Prayag Raj from Delhi to Allahabad: the devout worshipper of the Allahabadi Christmas cake. This is no elegant western pudding — it is redolent with desi ghee, petha, ginger, nutmeg, javitri, saunf, cinnamon, something called cake ka jeera and marmalades from Loknath ki Galli. All this is browned to perfection at a bakery that has acquired cult status — Bushy's on Kanpur Road. 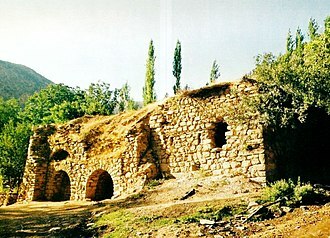 The ancient city has had a great baking tradition. It could be because Allahabad has a sizeable population of Christians. ^ a b Truscott, Jeffrey A. Worship. Armour Publishing. p. 103. ISBN 978-981430541-9. As with the Easter cycle, churches today celebrate the Christmas cycle in different ways. Practically all Protestants observe Christmas itself, with services on 25 December or the evening before. 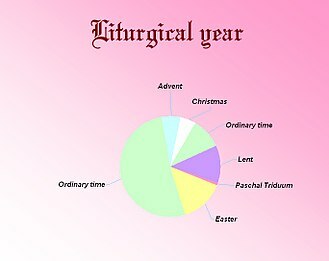 Anglicans, Lutherans and other churches that use the ecumenical Revised Common Lectionary will likely observe the four Sundays of Advent, maintaining the ancient emphasis on the eschatological (First Sunday), ascetic (Second and Third Sundays), and scriptural/historical (Fourth Sunday). 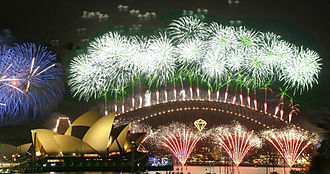 Besides Christmas Eve/Day, they will observe a 12-day season of Christmas from 25 December to 5 January. ^ Fr. Francis X. Weiser. "Feast of the Nativity". Catholic Culture. The Council of Tours (567) proclaimed the twelve days from Christmas to Epiphany as a sacred and festive season, and established the duty of Advent fasting in preparation for the feast. The Council of Braga (563) forbade fasting on Christmas Day. Thus the groundwork was laid for a joyful celebration of the Lord's nativity, not only in the house of God but also in the hearts and homes of the people. ^ Hynes, Mary Ellen (1993). Companion to the Calendar. Liturgy Training Publications. p. 8. ISBN 9781568540115. In the year 567 the church council of Tours called the 13 days between December 25 and January 6 a festival season. Up until that time the only other joyful church season was the 50 days between Easter Sunday and Pentecost. ^ Knight, Kevin (1908). "Christmas". 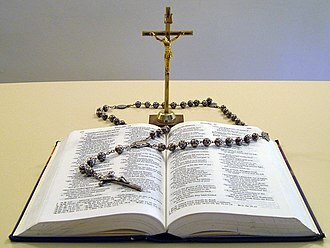 The Catholic Encyclopedia. New Advent. Retrieved 15 December 2014. The Second Council of Tours (can. 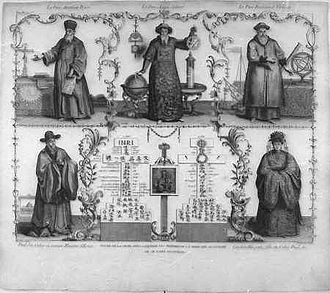 xi, xvii) proclaims, in 566 or 567, the sanctity of the "twelve days" from Christmas to Epiphany, and the duty of Advent fast; that of Agde (506), in canons 63-64, orders a universal communion, and that of Braga (563) forbids fasting on Christmas Day. Popular merry-making, however, so increased that the "Laws of King Cnut", fabricated c. 1110, order a fast from Christmas to Epiphany. ^ Bunson, Matthew (21 October 2007). "Origins of Christmas and Easter holidays". Eternal Word Television Network (EWTN). Retrieved 17 December 2014. The Council of Tours (567) decreed the 12 days from Christmas to Epiphany to be sacred and especially joyous, thus setting the stage for the celebration of the Lord’s birth not only in a liturgical setting but in the hearts of all Christians. ^ Kirk Cameron, William Federer (6 November 2014). Praise the Lord. Trinity Broadcasting Network. Event occurs at 01:15:14. Retrieved 25 December 2014. Another interesting thing is the Council of Tours in 567 A.D. What's that? Western Europe celebrated Christmas December 25 as the holiest day. Eastern Europe celebrated January 6 the Epiphany, the visit of the Wise Men, as the holiest day. I guess they didn't have other things to argue about back then but this was a big deal and so they had this council and they decided to make all twelve days from December 25 to January 6 the Twelve Days of Christmas. ^ Aloian, Molly (30 September 2008). Christmas. Crabtree Publishing Company. p. 17. ISBN 9780778742876. Going to Church Christmas Eve is a special time for many people. People may go to church on Christmas Eve. 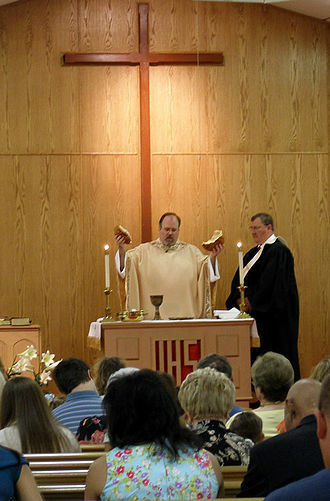 Churches usually have candlelight services or midnight masses. 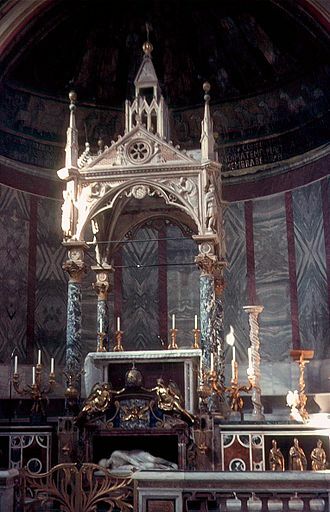 ^ Altar (1885). Before The Altar. p. 25. Retrieved 28 March 2015. 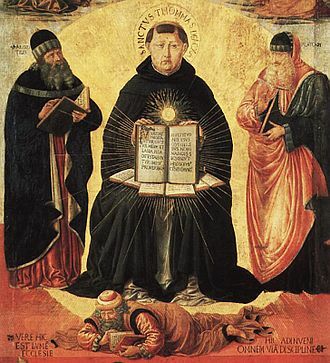 The frequency with which you should go to the Holy Table must depend on the special requirements of your own soul, on which it is well to take the advice of some Priest, as your spiritual adviser. The Church orders you to receive at least three times a year, of which one time is to be Easter, the other two presumably Christmas and Whitsuntide. ^ Bash, Anthony; Bash, Melanie (22 November 2012). Inside the Christmas Story. A&C Black. p. 132. ISBN 9781441121585. Popular tradition has it that there were three Magi because they presented three gifts to Jesus out of their treasure chests. The presentation of the gifts to Jesus out of their treasure chests. The presentation of the gifts is supposed to be the origin of the practice of giving Christmas presents. ^ Newman, Jay (1 January 1996). Religion Vs. Television: Competitors in Cultural Context. Greenwood Publishing Group. p. 101. ISBN 9780275956400. Then, of course, television regularly presents motion pictures (including made-for-television movies) and dramatic specials whose religious subjects or themes are so pronounced that they clearly qualify as religious television programs. One may immediately call to mind the Biblical epics of Cecil B. Demille, more sophisticated if somewhat ponderous films like The Song of Bernadette, The Robe, The Inn of the Sixth Happiness, and The Greatest Story Ever Told, and lighter but in some ways more moving films like Green Pastures, Here Comes Mr. Jordan, and Going My Way. These are but a few of the dramatic shows built around religious subjects and themes that commercial and public television stations in North America regularly deliver to their audiences. Although television news coverage of religion is essentially news programming and is not primarily inspired by religious motives, some of its offerrings do represent a kind of religious television programming, such as the outwardly pious features presented during the Christmas and Easter seasons or the features that provide a forum to prominent religious leaders and their opinions. ^ Lopez, Jadwiga (1 January 1977). Christmas in Scandinavia. World Book Encyclopedia. ISBN 9780716620037. The remainder of Christmas Day is spent snacking, playing with toys, reading new books, or napping. December 26 is a legal holiday, and is called "Second Day Christmas.” It is also St. Stephen's Day— the feast day of a Christian missionary, once a stable boy, who came to Sweden around A.D. 1050. Christmas Eve is the day before Christmas Day, the festival commemorating the birth of Jesus of Nazareth. Christmas Day is observed around the world, and Christmas Eve is widely observed as a full or partial holiday in anticipation of Christmas Day, both days are considered one of the most culturally significant celebrations in Christendom and Western society. 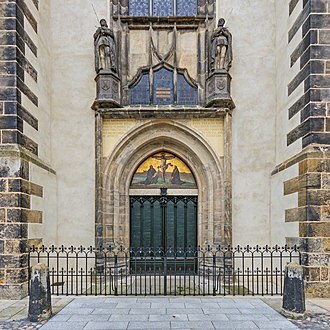 Many churches still ring their bells and hold prayers in the evening, for example. 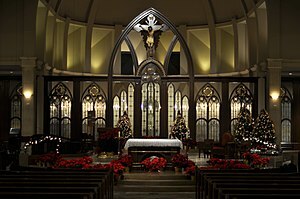 Since tradition holds that Jesus was born at night, Midnight Mass is celebrated on Christmas Eve, traditionally at midnight, roman Catholics and high church Anglicans traditionally celebrate Midnight Mass, which begins either at or sometime before midnight on Christmas Eve. This ceremony, which is held in churches throughout the world, celebrates the birth of Christ, Midnight Mass is popular in Poland. In recent years churches have scheduled their Midnight Mass as early as 7 pm. In Spanish-speaking areas, the Midnight Mass is sometimes referred to as Misa de Gallo, in the Philippines, the custom has expanded into the nine-day Simbang Gabi, when Filipinos attend dawn Masses from 16 December, continuing daily until Christmas Eve. In 2009 Vatican officials scheduled the Midnight Mass to start at 10 pm so that the 82-year-old Pope Benedict XVI would not have too late a night. Whilst it does not include any kind of Mass, the Church of Scotland has a service beginning just before midnight, the Church of Scotland no longer holds Hogmanay services on New Years Eve, however. The Christmas Eve Services are still very popular, on Christmas Eve, the Christ Candle in the center of the Advent wreath is traditionally lit in many church services. In candlelight services, while singing Silent Night, each member of the congregation receives a candle, lutherans traditionally practice Christmas Eve Eucharistic traditions typical of Germany and Scandinavia. Krippenspiele, special music for organ and brass choirs. A nativity scene may be erected indoors or outdoors, and is composed of figurines depicting the infant Jesus resting in a manger, other figures in the scene may include angels and various animals. The figures may be made of any material, and arranged in a stable or grotto, the Magi may appear, and are sometimes not placed in the scene until the week following Christmas to account for their travel time to Bethlehem. The Solemnity of Mary, the Holy Mother of God is a feast day of the Blessed Virgin Mary under the aspect of her motherhood of Jesus Christ, whom Christians see as the Lord, Son of God. It is celebrated by the Latin Rite of the Catholic Church on 1 January, Christians of Byzantine Rite and of all West Syrian Rite, South Syrian Rites and East Syrian Rites celebrate Mary as Mother of God on 26 December and the Coptic Church does so on 16 January. The Anglican Communion and the Lutheran Church observe the Feast of the Circumcision of Christ on January 1, the feast is a celebration of Marys motherhood of Jesus. The English title Mother of God is a translation of the Latin title Dei Genetricis and this title was dogmatically adopted at the First Council of Ephesus as a way to assert that Jesus is God, and that his mother can therefore be called Mother of God. 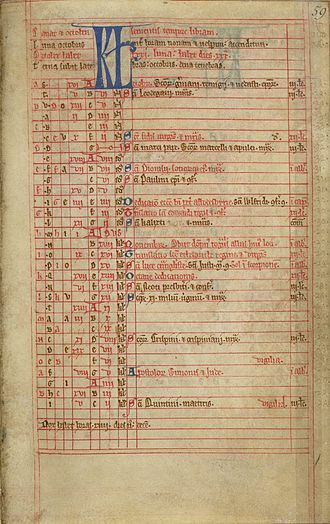 The title that the 1 January feast celebrates is not only Mariological. The Second Vatican Council stated, Clearly from earliest times the Blessed Virgin is honoured under the title of Mother of God, and at an early stage the Church in Rome celebrated on 1 January a feast that it called the anniversary of the Mother of God. The Massacre of the Innocents is the biblical account of infanticide by Herod the Great, the Roman-appointed King of the Jews. The number of killed is not stated. The Holy Innocents, although Jewish, have claimed as martyrs for Christianity. Most recent biographers of Herod deny that the event occurred, in Matthews account, Magi from the east go to Judea in search of the newborn king of the Jews, having seen his star in the east. The King, Herod the Great, directs them to Bethlehem and they find Jesus and honor him, but an angel tells them not to alert Herod, and they return home by another way. 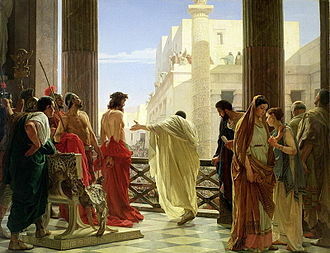 The Massacre of the Innocents is at Matthew 2, 16–18, although the verses form the context, When had gone. Get up, he said, take the child and his mother, stay there until I tell you, for Herod is going to search for the child to kill him. So he got up, took the child and his mother during the night, and left for Egypt, and so was fulfilled what the Lord had said through the prophet, Out of Egypt I called my son. The massacre is reported only in the Gospel of Matthew and other Christian writings likely based on that gospel, among those historians who doubt the massacres historicity, Geza Vermes and E. P. Sanders regard the story as part of a creative hagiography. Robert Eisenman argues that the story may have its origins in Herods murder of his sons, david Hill acknowledges that the episode contains nothing that is historically impossible, but adds that Matthews real concern is. With theological reflection on the theme of fulfillment, brown sees the story as patterned on the Exodus account of the birth of Moses and the killing of the Hebrew firstborn by Pharaoh. Brown and others argue that, based on Bethlehems estimated population of 1,000 at the time, the largest number of infants that could have been killed would have been about twenty, and R. T. The storys first appearance in any other than the Gospel of Matthew is in the apocryphal Protoevangelium of James of c. And Mary, having heard that the children were being killed, was afraid, and took the infant and swaddled Him, and Elizabeth, having heard that they were searching for John, took him and went up into the hill-country, and kept looking where to conceal him. The Holy Family consists of the Child Jesus, the Virgin Mary, and Saint Joseph. Veneration of the Holy Family was formally begun in the 17th century by Saint François de Laval, the first bishop of New France, the Gospels speak little of the life of the Holy Family in the years before Jesus’ public ministry. Matthew and Luke narrate the episodes from this period of Christs life, namely his Circumcision and Presentation, the Flight to Egypt, the return to Nazareth, and the Finding in the Temple. 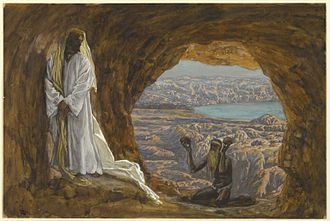 Joseph and Mary were apparently observant Jews, as Luke narrates that they brought Jesus with them on the pilgrimage to Jerusalem with other Jewish families. The Feast of the Holy Family is a celebration in the Catholic Church in honor of Jesus of Nazareth, his mother, the Blessed Virgin Mary. The primary purpose of this feast is to present the Holy Family as a model for Christian families and it is a holy day of obligation only if it falls on a Sunday. The feast was instituted by Pope Leo XIII in 1893 and set on the Sunday within the Octave of the Epiphany, the 1962 Roman Missal, whose use is still authorized, follows the General Roman Calendar of 1960, which has the celebration on that date. The Holy Family is a theme in Christian art. An oil painting by the Dutch Joos van Cleve, dated to about 1512, is on display at the New York Metropolitan Museum of Art, michelangelos tempera rendition hangs in the Uffizi in Florence, Italy. A Holy Family by Giulio Romano is on view at the Getty Center in Los Angeles, the members of the Holy Family are the patrons of the Congregation of Holy Cross. The Holy Cross Sisters are dedicated to the Immaculate Heart of Mary, the Holy Cross Brothers to St. Joseph, the Sons of the Holy Family is another religious congregation devoted to the Holy Family. The Cathedral of the Holy Family of Nazareth is the see of the Diocese of Tulsa in Oklahoma. A pious practice among Catholics is to write J. M. J. at the top of letters and personal notes as a reference to Jesus and Joseph as the Holy Family. Brothers of Jesus Chronology of Jesus Finding in the Temple Flight into Egypt Holy Kinship Sisters of the Holy Family of Nazareth Remarks of Benedict XVI on the Feast of the Holy Family Pope Francis. A children's nativity play in Sanok, Poland 2013.